This coming week, we will take one product we have used with governments and cooperatives around Africa to the retail consumer market. Zenvus Boundary maps farm, land or house perimeter boundaries, calculates the areas and populates the data onto Google Earth. And from Zenvus portal, the surveys can be downloaded or printed. It supports cooperatives, governments and individual farmers enabling these entities to have survey data at a fraction of the typical cost of surveys. Any person that uses smartphone or tablet can easily use this app to map a farm, land or house perimeter in any location. It does not require internet access to map the farm but requires one later for data transfer to Zenvus portal. You can map many farms before transfer in areas with no internet access. 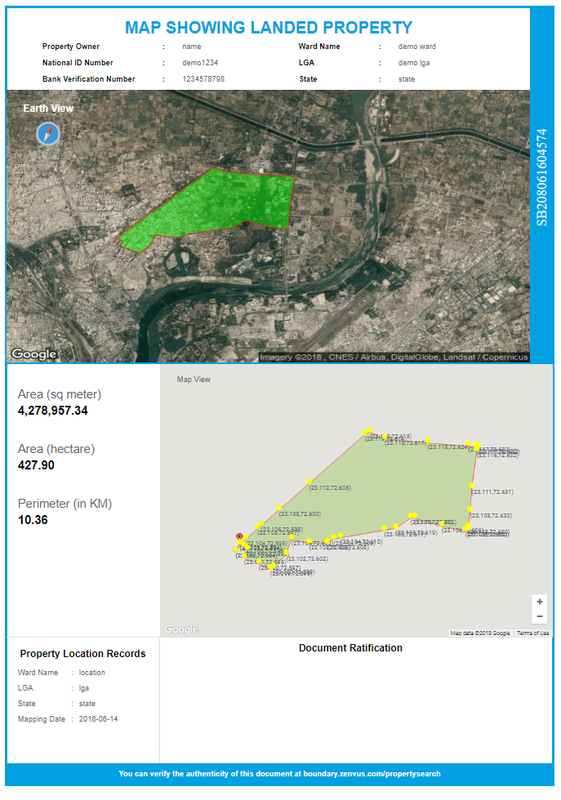 We have set the price of using this solution to map a farm, land, or house perimeter with the survey printed on Zenvus portal at $20 (N7,000 Nigerian naira) per property to maximum of 5 acres [for example, 6 acres would be captured as two farms, for $40]. You would have the opportunity to include your name, LGA, National Identity Number, etc. We also have franchising/agent opportunities. It requires a one-time license fee [email for details] and offers 90% royalty on sales [You charge the farmer $20 but you send 10% to us while keeping 90%].You would have an enterprise account which will make it possible to map thousands of farms. If you are interested, contact zenvus@fasmicro.com. Note: our team has demo logins you can request via email to see how the system works and how you could build a business with Zenvus Boundary. You can download the app here on Google Play. Note: This technology was originally developed to map and survey perimeters of farms and farmlands for farmers. Though it can be used for perimeter of houses, lands, farms etc, we do not claim that it can be used in your jurisdiction for other purposes. People that want to see the boundaries of their properties (farm, land, home) have found the solution useful as we overlay that survey on Google Earth visualizing the whole experience. You may need to contact your government before you plan to use it for other purposes. Every farm that has been mapped with Zenvus technology is automatically optimized for deployment of our sensors. We use the perimeters of the farms to know where the AI / analytic should focus as they communicate with farmers. We do not want to waste time analyzing the farmland of your neighbor; we only need yours and this mapping makes that possible. Sure, there is no harm having the perimeter of that empty land, your home, etc all superimposed on Google Earth. There is nothing in a Surveyor General report that is not in this work except that no one is my office has a paid membership of the association. Yes, we do not have the stamp. So, do not ask. As an agent? Please email the email provided.